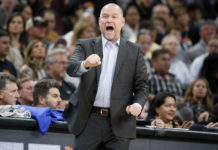 After starting the preseason with three straight victories, the Denver Nuggets suffered their first loss of the season with a 109-103 defeat at the hands of the Los Angeles Clippers. 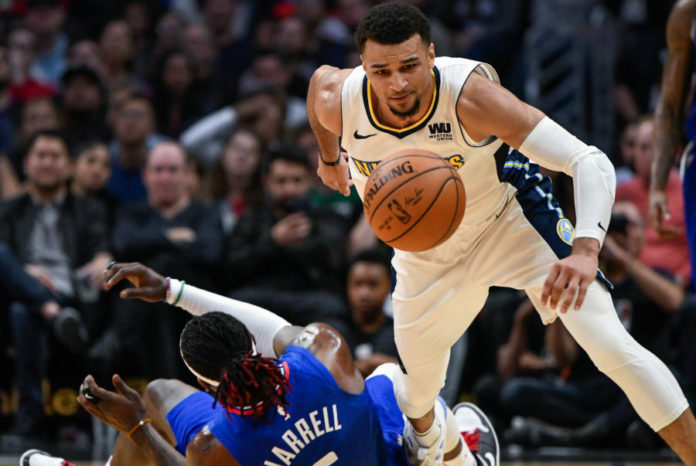 With Denver’s starting unit playing in just their second game together, the offense was off-and-running after a three pointer from Jamal Murray on the Nuggets first possession of the night. 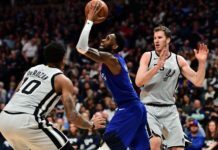 After starting the game on a 7-2 run, courtesy of a Will Barton three, the Clippers were able to claw back into the game thanks to a 10-0 run of their own to stretch their lead to five points. During that run, the Nuggets starters struggled defending Danilo Gallinari and Boban Marjanovic in the paint. Both players consistently had their way in the post and were able to force two quick fouls on Nuggets’ center Nikola Jokic. Jokic would stay in the game as the Nuggets offense finally found some sort of rhythm. A welcome sight came midway through the first when Gary Harris dribbled through the lane and threw down a nasty dunk, reassuring us that his hamstring strain is feeling much better. As the Nuggets offense struggled to sustain any sort of consistency, Paul Millsap shined on the defensive end of the floor with three blocks in the first quarter. After his first career ejection last Friday against Perth, Millsap bounced back going on a personal 4-0 run to spark the Nuggets offense giving them a 22-20 lead with just under three minutes remaining in the first. The Nuggets starters ended up playing every minute in the opening frame, but still trailed 30-26 going into the second. Denver’s bench unit began the second quarter for the Nuggets, allowing the Clippers to open on an 8-2 run. That run pushed the Clippers lead to 10 points, with the Nuggets bench unit needing to respond quickly. After a timeout by Nuggets’ head coach Michael Malone, Denver’s second unit came out and played inspired basketball going on a 15-5 run highlighted by solid play from Trey Lyles, Torrey Craig, and Malik Beasley. After 14-straight points, Denver stretched their lead to 47-43 before the Clippers went on a 9-0 run to give themselves a five-point lead. In what ended up being a back-and-fourth second quarter, the Nuggets battled back taking a 64-61 lead into halftime. Denver scored 38 points in the second quarter thanks to solid play from both Lyles and Craig. At the break, Lyles led all scorers with 12 points while also hauling in six rebounds and dishing out three assists. Craig followed not far behind with seven points on 3-3 from the field, while also adding in two blocks. Other stat lines of note were Barton, who had 11 points to lead all starters, and Monte Morris, who led the team in assists with five to go along with seven points. The first quarter ended up being all we would see from the Nuggets starting unit, as the bench unit of Morris, Lyles, Craig, Beasley, and Mason Plumlee were on the floor to start the second half. A Clippers 13-4 run to start the third quarter pushed their lead to six, as they continued to ride the performances of Gallinari and Marjanovic. Gallinari led all Clippers starters with 16 points, as Marjanovic continued his trend of annihilating the Nuggets as he finished the night with 14 points, 12 rebounds, three blocks while going 5-8 from the field. Just like he did when matched up against Jokic, Marjanovic had his way with Plumlee and was the biggest reason why the Clippers led for most of the third quarter. Once the Clippers starters exited the game, the Nuggets bench unit was able to regain some consistency and cut the Clippers lead to 78-76 with two minutes remaining in the third. A 6-0 run from Morris and Beasley helped get the Nuggets back into the game, before a Lyles three-point play tied the game at 80, which would be the score heading into the fourth quarter. 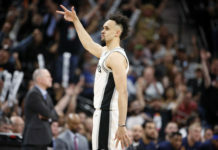 After shooting just 5-20 in the third quarter, the Nuggets struggled to score the ball to begin the fourth and trailed 90-82 with nine minutes remaining. Another Denver run got them back into the game though, as Juancho Hernangomez and Beasley energized the Nuggets on a 7-0 run to cut the Clippers lead to one. Although, the run would be all for not as the Clippers were able to hang on and defeat the Nuggets by a score of 109-103. It wasn’t for lack of effort by Hernangomez though, as he finished the night with 11 points and led the Nuggets with 12 rebounds. Lyles led the Nuggets in scoring with 15 points on 6-12 shooting from the field and also grabbing 10 rebounds to give him a double-double. Morris was the Nuggets second-leading scorer with 14 points and led the team in assists with six. Beasley also added in 12 points off the bench as he continued his solid preseason. The Nuggets will now have two days off before they’re back in action Friday night in Chicago to face the Bulls in Chicago.